The dazzling showcase of Samajwadi Party’s official website is awaiting a major revamp. At least three portraits of the nine high-profile leaders displayed on the welcome page have to be marked for deletion. The changes in store may help emergence of an unadulterated socialist face, which the party once claimed to represent. For a change let’s not talk of Amar Singh and his plans. Let’s just stick to discussing the Samajwadi Party’s gains and losses in his adventurous company. Amar Singh’s contributions to the SP were visibly registered on August 29, 2003, the day Mulayam Singh took oath for his third term. Vastly in disagreement with the party’s pro-poor ideology, he added the tinsel town glitter and he brought a group of industrialists in close contact of the former chief minister. His third major contribution was that he was the articulate face of the party in Delhi hobnobbing with rival parties, striking political and other deals and handling media with his typical bluster. All the three contributions boomeranged. The stars including the Bachchan family created a gulf between the “dhartiputra Mulayam” and his supporters at large, who could see him from a distance only. Amar Singh’s move to blindly back Jayaprada in Rampur elections infuriated party’s most known Muslim face Azam Khan, who quit just after the Lok Sabha elections. His decision to bring in Kalyan Singh in the SP cost “Maulana” Mulayam Singh, popular Muslim support and leaders like Azam, Saleem Sherwani, Shafiqur Rehman Berq, Shahid Siddiqui and Afzal Ansari. Even Mulayam’s trusted lieutenants like Beni Prasad Verma, Raj Babber, Naresh Agarwal and at least a dozen more left SP protesting against Amar Singh’s domineering ways. Then again in 2009 Amar Singh was instrumental in scuttling an almost certain Congress -SP alliance. “The Congress was seeking to contest just 22 seats to which he (Amar) did not agree”, says Naresh Agarwal, now BSP general secretary, who along with Saleem Sherwani quit SP after its decision not to have an alliance with the Congress. The Congress won 21 seats in 2009 Lok Sabha elections just two less than SP’s 23. Amar Singh’s industrialists’ club, which included Anil Ambani, Adi and Parmeshwar Godrej, Kumar Manglam Birla, L.K Khaitan, Subrato Roy Sahara formed the UP Development Council with Singh as its chairman. It held some star-studded meetings with Amitabh Bachchan as the brand ambassador. The council promised to bring in investments of Rs 4000 crore and developing 15000 acres of industrial area but nothing happened on the ground. 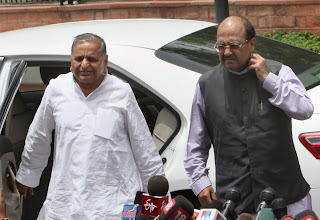 To add to Mulayam’s woes was the telephone-tap in February 2006, which had him and Amar Singh discussing settling sugar prices to suit the sugar lobby, ways and means to “manage” judiciary and other embarrassing issues. The losses are far greater than the numbers reflect. Conceding 35 of the total 36 Vidhan Parishad elections held on January 7 or a massive shortfall of 18 Lok Sabha seats in 2009 are serious warnings. Oblivious as he has been until Amar Singh’s fourth resignation on January 6, there were enough and more red signals on the way for party chief Mulayam Singh. The party lost 46 Vidhan Sabha seats in 2007,which resulted in a big way in bring BSP to power. There have been desertions galore. Party’s support base is shaken to the hilt. Mulayam’s daughter-in-law Dimple Yadav’s defeat in Firozabad byelection in November 2009 at the hands of Congress’s Raj Babber by 85,000 votes proves this beyond doubt. Mulayam Singh chose to ignore all.